One of the best things I've learnt to bake over the past couple of months (of rather zealous weekend baking stints if I might say so myself) is this - Japanese milk bread! :) The best thing about this, apart from the fact that it's incredibly light, fluffy, and browns beautifully on the outside, is that the variations to this basic bread are endless. I baked this plain/basic version about two weeks back and since then I've already attempted a couple of variations - adding raisins to them, making a Matcha and Azuki Swirl pattern, and just today, I did a walnut and raisin braided version which tastes even better that the raisin one alone. :) And it's just the beginning. I've already seen recipes for Custard fillings and there are probably tons more out there that I've yet to discover or think up for myself. 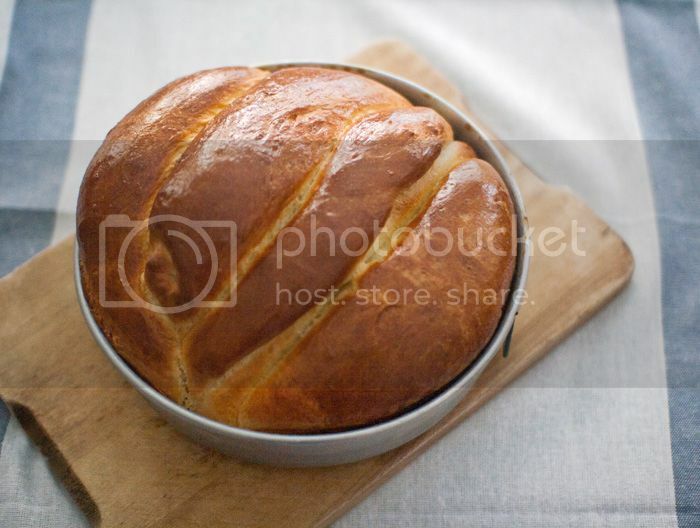 This is how my very first bread loaf looked like. 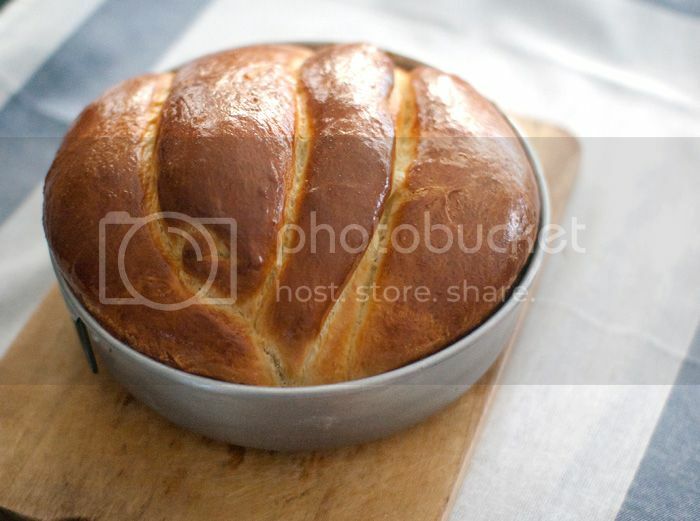 I know it's somewhat strange since the individual loaves are in an elliptical form, but this is me, not realizing that all I had to do was shape them into round balls to place in the pan to get the typical bread loaf appearance. ;p The things we learn every day. 1. To make the Tang zhong mixture, whisk together 1/3 cup of flour in a saucepan and heat the mixture over medium heat until it thickens (don't bring it to a full boil!). 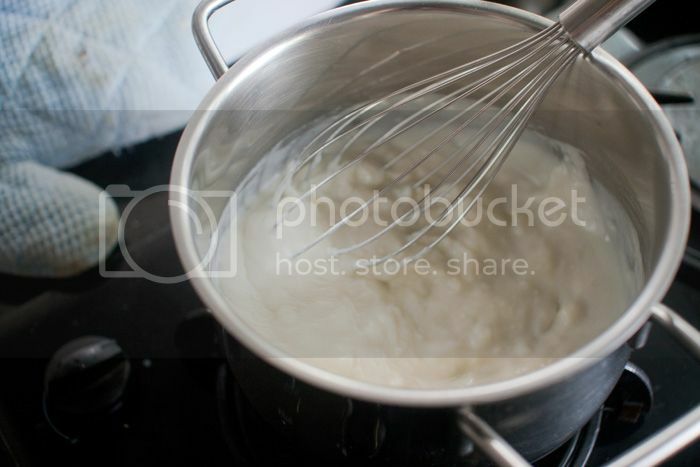 Whisk the mixture while it's being heated up and after a few minutes, almost magically, it'll start to thicken until it resembles a white paste. When that happens, switch off the heat, and let your Tang Zhong mixture cool by the side. Here's what it more or less looks like when the Tang Zhong mixture is done! 2. 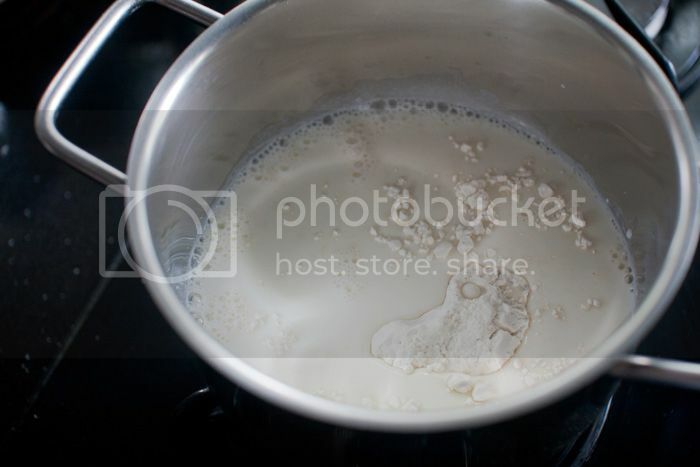 In a small bowl, combine 1/2 cup of warm milk, 2 tsp of yeast and 3 Tbs of sugar (I used normal white caster sugar). 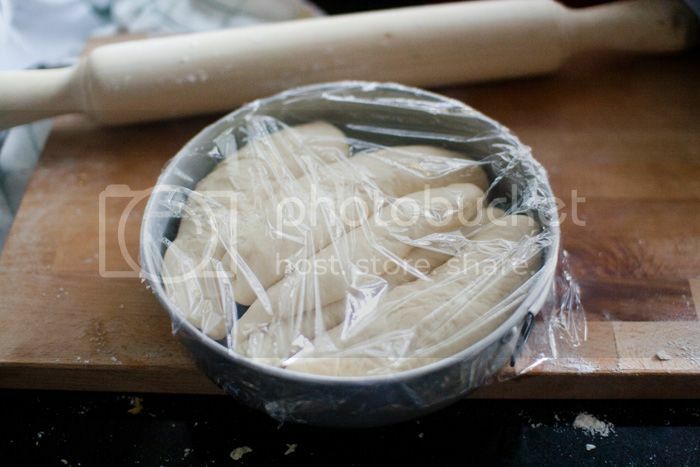 Whisk it together and set it aside for a few minutes to let the yeast start. 4. 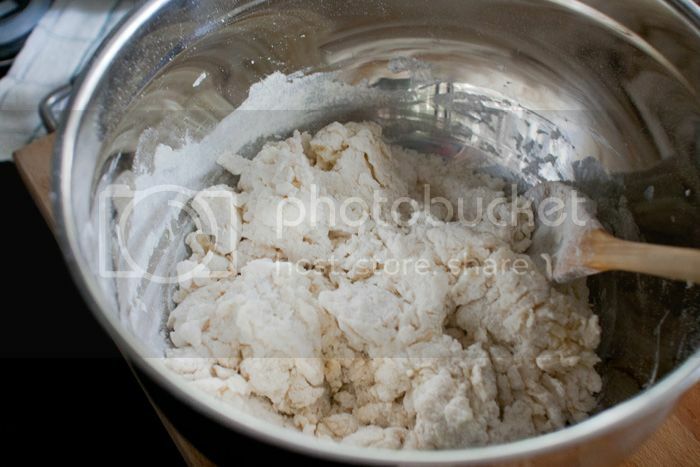 When the wet and dry ingredients have more or less come together to form a dough, add in the 2 Tbs. of softened butter. Continue mixing it in. 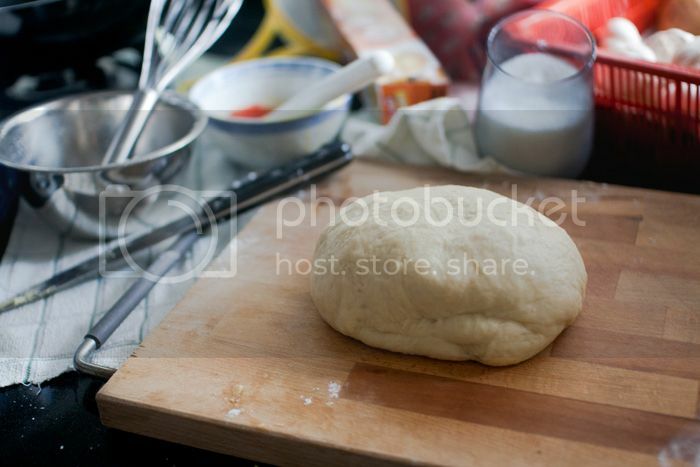 If the dough looks shaggy, you can add in some flour until it doesn't cling to the sides of the bowl any more. 5. 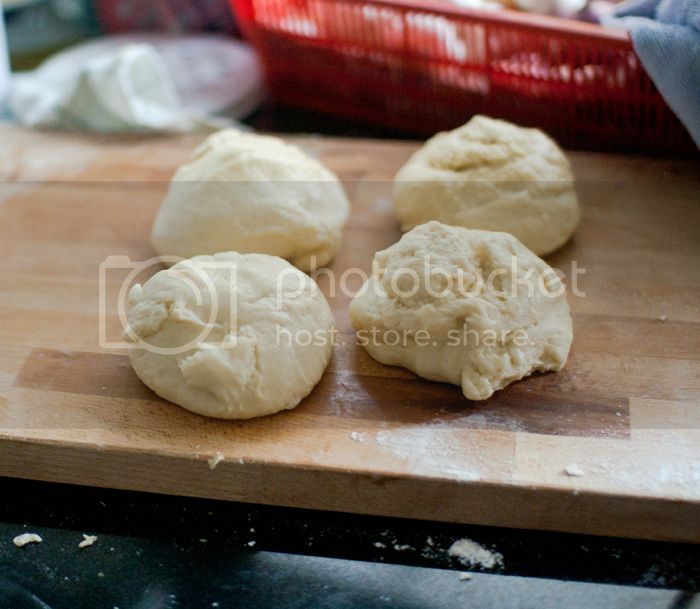 Transfer the dough to a well-floured surface and knead it by hand till it becomes less sticky. Since I don't have a mixer, I just kneaded it for about 5 - 8 minutes (or until I got tired ;p), adding some flour whenever the dough became a bit too sticky. 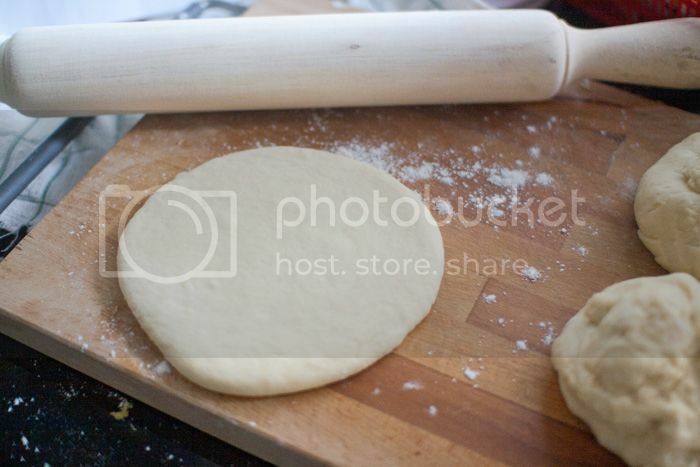 Shape the dough into a ball and let it rise in a well-oiled bowl for about 1 hour or until it has doubled. See, unfortunately I didn't have the sense to shape each rolled up disc into a ball and instead I merely laid each rolled-up disc flat, parallel to each other. ;p I mean it really doesn't make a difference to the taste or the end product, just that you don't get the typical bread loaf appearance. Ta-dah! Don't you love the gorgeous shade of brown with its lovely sheen? And trust me, it tastes SO good as a plain loaf of bread. Definitely not on the sweet side so it goes really well with jam. And something that my mum really liked was the bread sliced up thinly and then re-toasted in the toaster oven. Do that for about 1.5 minutes (make sure you watch the bread at about that time to make sure it doesn't burn!) 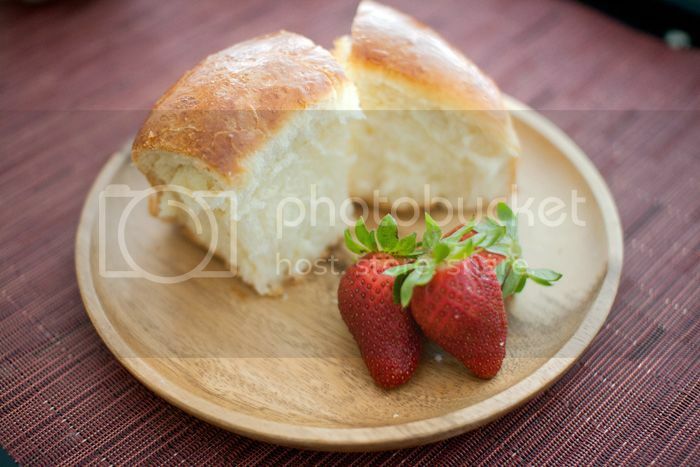 and then you'll get a really crispy slice of Japanese Milk Bread. Pretty darn awesome especially if you like crispy food. Today I made a walnut and raisin braided version which I like even more than the plain one. Will share that with you soon. Wow, it looks so delicious! Yummy ~ It looks so soft and delicate! this looks so milky and light and fluffy and delicious! I wish I could bake, hahah but i sadly cannot, and would definitely butcher this if I tried!